in different fields of study for Bachelors, and Masters. you can apply for BS - Bachelor of Science, and B.Sc. - Bachelor of Science, MS - Master of Science, and M.Sc. - Master of Science, . 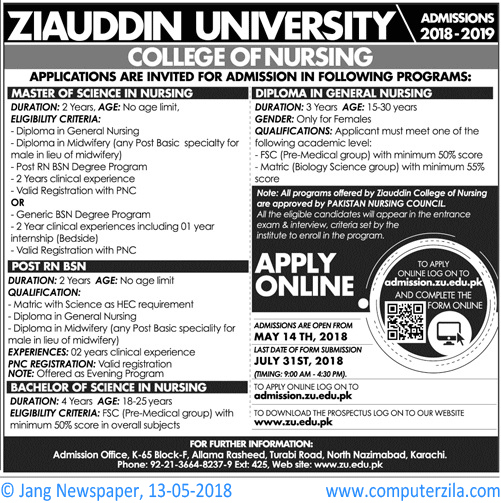 Diploma in Midwifery, Diploma in General Nursing, POST RN BSN Degree, 2 years clinical experiences, valid registration with PNC, Generic BSN Degree Program, 2 year clinical experiences. University Address Admissions Office, K-65, Block - F, Allama Rasheed, Turabi Road, North Nazimabad, Karachi, Pakistan.